In September 2010, Oracle announced the new Unbreakable Enterprise Kernel (UEK) for Oracle Linux as a recommended kernel for deployment with Oracle Linux 5. Starting with Oracle Linux 5.5, Oracle give you could choose to use either the Red Hat Compatible Kernel or the UEK. 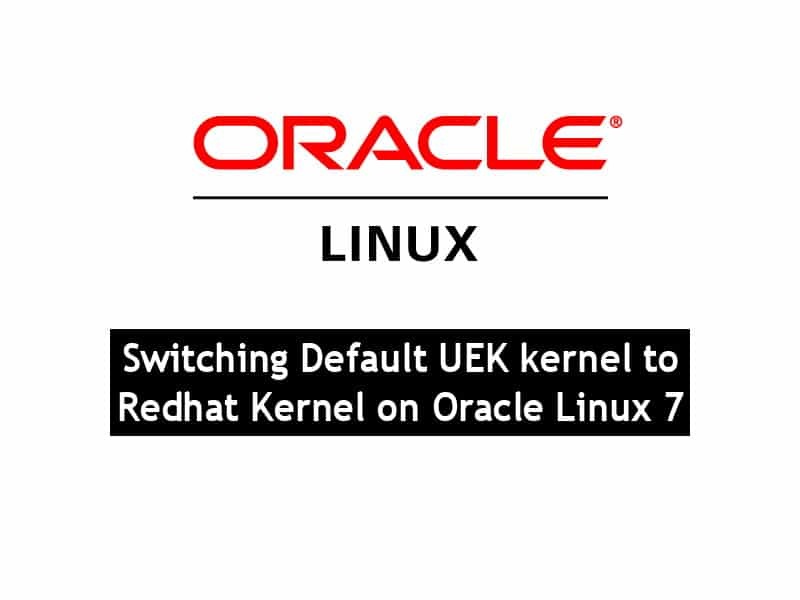 In Oracle Linux 5.6 and above, the UEK became the default kernel for Oracle Linux. 2. Grep the list of the available kernel in Oracle Linux 7. The sequence of entry will start with 0. I hope this article gives you some ideas and essential guidance on how to Switching Default UEK kernel to Redhat Kernel. *Do not edit the GRUB 2 configuration file directly. On BIOS-based systems, the configuration file is /boot/grub2/grub.cfg. On UEFI-based systems, the configuration file is /boot/efi/EFI/redhat/grub.cfg. *The grub2-mkconfig command generates the configuration file using the template scripts in /etc/grub.d and menu-configuration settings taken from the configuration file, /etc/default/grub. This article will describe the procedure to configure static Ip address on RHEL 7/CentOS 7/Oracle Linux 7 minimal installation. Network interface configuration files control the software interfaces for individual network devices. As the system boots, it uses these files to determine what interfaces to bring up and how to configure them. These files are usually named ifcfg-name. Since the release of RHEL 7, redhat come with the new naming scheme for the network devices. In RHEL7/CentOS7/Oracle Linux 7, the default network interface name is based on firmware, topology, and location information. In this procedure, the network interface name is ifcfg-ens160. Security-Enhanced Linux (SELinux) is an implementation of security policies for operating systems that provides a mechanism to support and help control access in the linux kernel. On Red Hat Enterprise Linux 7 (RHEL 7), CentOS 7 and Oracle Linux 7 (OL7), SELinux services were installed by default. The following tutorial will show you the basic steps to permanently disable SELinux on RHEL 7, CentOS 7 and OL7. Traceroute command is a network diagnostic tool for displaying the route packets take to network host or destination. It shows how long each hop will takes and how many hops that the packet requires to reach the specify destination. In linux, traceroute command is used while in windows and dos environment, they used tracert command. In this post i will show you how to install and how to use traceroute command to diagnose your IP network related issues. This steps has been tested on RHEL 6/7, CentOS 6/7 and Oracle Linux 6/7. 2 is the ISP the origin computer is connected to. Minimal time interval between probes (default 0).